WASHINGTON — The summer of 2017 has seen two U.S. Navy destroyers sidelined by broadside collisions with slower commercial tankers, resulting in the deaths of 17 sailors. The two collisions in the span of 65 days came in the wake of earlier inicidents in the year that saw one Japan-based cruiser running over a Korean fishing boat and another grounding in Tokyo Bay, spilling hundreds of gallons of oil. The incidents prompted the removal of the U.S. Navy’s 7th Fleet commander, Vice Adm. Joseph Aucoin. They also triggered a fleetwide review led by Adm. Phil Davidson, head of Fleet Forces Command and a high-level review of safety practices in the fleet. Congress has also taken notice of the Navy’s continuing problems. Rep. 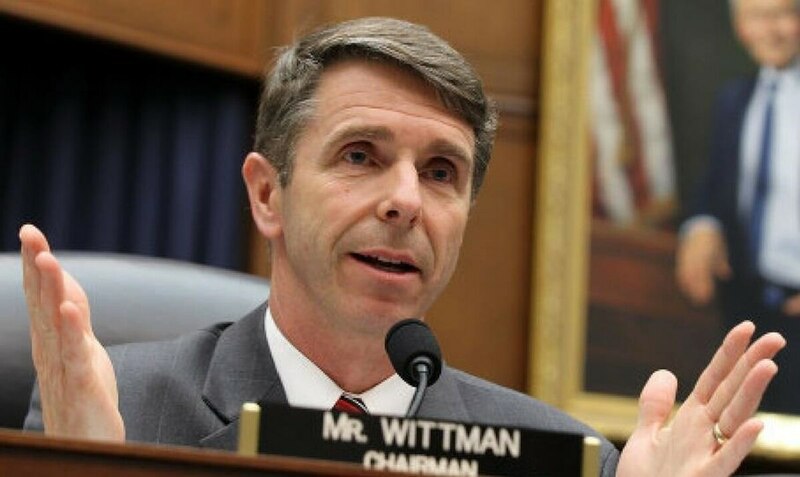 Rob Wittman, R-Va., the chairman of the House Armed Services’ Seapower and Projection Forces Subcommittee, traveled to Japan to visit the fleet and speak with Navy leaders and sailors about what Congress can do to help get the service back on track. Upon returning, he sat down with Defense News naval reporter David Larter to talk about the trip. In the wake of the collisions and groundings in 7th Fleet, what do you think is going on in the Pacific and what needs to be done to fix it? We had the opportunity there in Yokosuka, [Japan], to sit down with Adm. [Phillip] Sawyer who’s the new commander of 7th Fleet. Obviously, the loss of life of our sailors is first and foremost in our minds. I had an opportunity to go there and visually inspect the [destroyer] Fitzgerald. It’s just unbelievable the amount of damage to that ship and to see what those sailors went through on that ship. I think, it causes all of us to really ask some fundamental questions about what is happening within the Navy that allowed these incidents to occur. These are the most advanced warships in the world. They can do some miraculous things with the Aegis systems on board, with ballistic missile defense. But one of the most basic elements of our Navy is to be able to safely navigate, and that means not running into or having things run into you. And when those things happen they cause all of us to really, I think, take issue with those incidents, learn from them, understand what has happened and to make sure that those things don’t happen again. It’s particularly concerning because of the rash of incidents that we’ve had and the severity of these instances where we’ve had loss of life with sailors. We’ve had significant collisions, not glancing blows, but these are head-on collisions amidships on both of these warships. So all of those things really beg the question: What led to this? Spencer's comments spoke to the current and future state of the Navy at a time of change and uncertainty. So what did leadership in Japan tell you about what might be behind it? As we are hearing from the Navy, as we’re beginning to dig down ourselves, and as I’ve talked to Adm. Sawyer and others; there’s not a single cause. There’s not something you can point to and go: “Oh, this is it.” I think in looking at it, there are a lot of areas that we really need to question and dig into: Operations tempos, training schedules — I think all of those things are fundamental questions. And as I said, what we’ve been able to gain doesn’t point us to a single cause, but it points us to a number of causes. You are holding a hearing this week in the House Armed Services Committee with the vice chief of naval operation and the Government Accountability Office. What are you hoping to hear from the witnesses? And what do you see Congress’ role as in helping the Navy get back to where the country expects it to be? Well, what I want to hear from the Navy, and Adm. [Moran] and others, is I want to hear the exact nature of what they are doing to analyze what happened. I want to make sure that we are all confident that they are leaving no stone unturned at every level to determine why did these tragic events happen. Secondly is: What have they done most immediately to address these? Obviously, they stood the fleet down for the day, but what additional measures have they taken to address this? And finally: What are the steps that are subsequently needed both by the Navy, by the Department of Defense and by Congress to make sure that this doesn’t happen again? So one of the concerns I’ve heard from sailors in the wake of these accidents is about crew rest and sleep. I’ve also heard discussions about manning on the ships. You know, the GAO a few months ago came out with a report that said the Navy often sets the goal posts shy of where they actually need to be in terms of how many sailors you have on board to complete the functions of that ship. Are those concerns you’re hearing from 7th Fleet? Those are exactly the things I heard from 7th Fleet. I heard those from not just senior leadership there, but leaders at the deck-plate level about all the things that we ask our sailors to do, and they are miraculous in doing all those things. But there’s only so far that you can push before you have an effect. Whether it’s operations tempo and deployment cycles, [manning], the expectations that we have for sailors. So I think all those things need to be looked at. But talking to folks at the deck-plate levels, I do believe that it’s a contributory factor. I think the Navy’s going to have to really do some soul-searching about how they do those things, and I understand that the demand signal that comes from around the globe, you know, gets a vote in all of this. I understand that many times we don’t have an alternative. So the sailors that are there are being asked to do things, being asked to do things at a significantly increased pace. But we have to understand, too, that there are limitations to what we can ask for. Then that goes back to looking at Congress and saying: “Are we trying to do too much with the resources that we have?” That’s either with the number of ships, the number of sailors. And so that begs questions about end strength. Do we have the proper end strength for the Navy? Are the training programs proper? Are the deployment programs proper? Are the watch-standing schedules proper? You know, all of those things should be looked at in determining what’s the cause and what do we do to really get our arms around this. Congress tends to get bogged down in weapons, platforms and procurement. Do you think that given the situation that we saw this summer with those two ship collisions, on top of a deadly MV-22 crash, is Congress going to have the focus and the attention to really make sure the Navy follows through on making necessary changes to how they do business? I think we’re going to have to. I think this is as important, if not more important, than the hardware in our Navy. We can resource new ships, we can resource advanced systems, but the ability of our Navy rests in its sailors, and the ability of our Navy to perform these advanced missions and to be successful in those advanced missions rests with our sailors. The hardware that we provide them, the ships that we provide them, are only as good as the sailors. So we can’t forget what should be our priority. Our priority should be our sailors, our Marines, our airmen, our soldiers and our Coast Guardsmen. So that’s across the board. I don’t want to segregate out sailors because in the full scope of things Congress needs to look at all of them. There is a limit as to what we can ask sailors to do, and to perform the role at the highest levels that we ask them to perform it in. And that’s not a fault of their own. That’s just the limitation of what we can do as human beings in operating at that high level. It is my purpose and objective to make sure that that doesn’t get forgotten in all this, because you’re right. We can talk about systems, numbers of ships, all those things, but we forget that those pieces of steel and those systems out there are only as capable as the abilities of our sailors and the opportunities we give for them to be successful there.